State Department spokeswoman says Bennett's plan to annex Area C doesn't reflect the Israeli government's position. The U.S. State Department on Tuesday dismissed Economy Minister and Jewish Home Chairman Naftali Bennett’s plan that would see Israel annexing Area C.
According to spokeswoman Jen Psaki, Bennett’s plan “does not reflect” the position of the Israeli government. “We have seen similar statements to Minister Bennett’s. We’ve seen them in the past. They don’t reflect the position of Prime Minister Netanyahu’s government,” she told reporters. “Our position is clear. Final status issues including borders can only be resolved through negotiations between Israelis and Palestinians, and obviously we believe that’s the proper place for addressing them,” added Psaki. In April, Bennett drafted a letter to Prime Minister Binyamin Netanyahu, demanding that Israel establish full sovereignty over "settlement blocs" in Judea and Samaria. 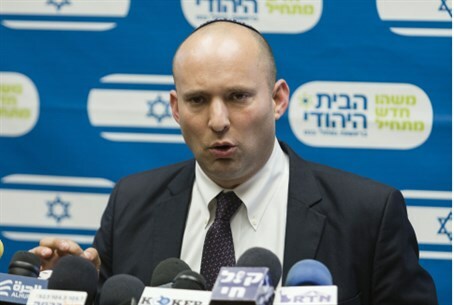 Justice Minister Tzipi Livni had harsh words for Bennett over his letter. "I ​​heard Bennett sent a letter to the Prime Minister in which he proposed to annex the settlement blocs," Livni said. "I am tempted to say why not, go for it, if you go crazy then do it to the end - keep this up and we'll become a binational state and lose all that is dear to us. Why not!" The talks were suspended by Israel after PA Chairman Mahmoud Abbas’s Fatah faction made a unity pact with Hamas.